WHERE: 36 Audrey Ave., Oyster Bay INFO: 516-802-5546, oysterbaybrewing.com FEATURES: Well-behaved dogs on leashes allowed, a water bowl is put out for canine guests; tasting room serves several beers; occasional events. WHERE: 507 Guy Lombardo Ave., Freeport INFO: 516- 442-0565, tonycubanrestaurant.com FEATURES: Pups are welcome to join their human companions for a meal in the outdoor dining area. The menu features a blend of Italian and Cuban flavors and an array of margaritas and other cocktails. WHERE: 66 Newtown Lane., East Hampton INFO: 631- 329-5377, babettesrestaurant.com PET FEATURES: From breakfast tacos to a housemade veggie burger, Babette's in East Hampton has something for everyone -- including your doggo. 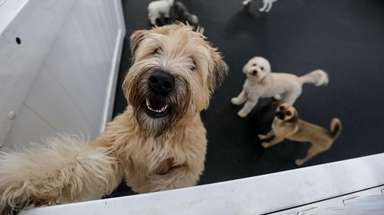 The organic eatery welcomes pets both indoors and out, plus they offer a special menu just for them. WHERE: 271 Woodcleft Avenue., Freeport INFO: 516-321-0633, ottosseagrillfreeport.com PET FEATURES: Soak up the sun with your beloved pup this summer at Otto's Sea Grill, located on the Nautical Mile in Freeport. Leashed dogs may relax at the outdoor bars and table. 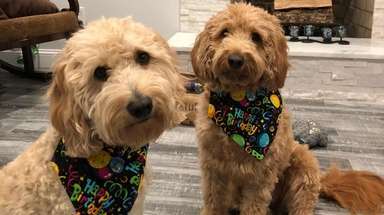 There's a watering station and a "Doggie Delight" menu, which offers grilled hamburgers, hot dogs and fried chicken fingers for any hungry pooches. WHERE: 24 Central Ave., Massapequa INFO: 516- 590-7477, americanbeautybistro.com PET FEATURES: Well-mannered pooches on leashes are welcome to water bowls in the outdoor seating area; the eatery's menu features classic comfort dishes including short ribs and a three-cheese mac. WHERE: 22 Mill Creek Rd., Port Jefferson INFO: 877-475-2739, portjeffbrewing.com PET FEATURES: Leashed dogs are permitted, offers a water bowl and dog treats; tasting room and porch, several beers are available by tasting flight and by pint. WHERE: 515 Broad Hollow Rd., Melville INFO: 631-577-4444, refuge110.com PET FEATURES: Leashed dogs are permitted on the patio (11 a.m.-3 p.m.), free dog treats and water are offered; an upscale brunch menu is available for human guests. WHERE: 540 Dune Rd., Westhampton Beach INFO: 631-288-5810, therestaurantsweb.com FEATURES: Special water trough (the "Paw Bar") for visiting dogs; tavern serving seafood and grill food. WHERE: 62 E Main St., Bay Shore INFO: 631-647-8300, localburgerco.com FEATURES: Water bowls available for visiting dogs; tavern serving gourmet burgers and upscale grill food. WHERE: 2182 Sound Ave., Baiting Hollow INFO: 631-630-9322, lispirits.com FEATURES: Leashed dogs permitted, a water bowl is occasionally available; tasting room, spirits available in tasting flights, cocktails are served, weekends offer live music and food trucks. WHERE: All Long Island locations (Garden City: 860 Old Country Rd., 516-620-2880; Lake Grove: 2093 Smith Haven Plaza, 631-246-1096; Melville: 849 Walt Whitman Rd., 631-386-8017; New Hyde Park: 1570 Union Tpke., 516-634-2010) PET FEATURES: Dogs allowed on patio; restaurants offers a "Woof Menu" with ShackBurger dog biscuits and "Pooch-ini" desserts (Shackburger dog biscuit, vanilla custard, peanut butter sauce). More information at shakeshack.com. WHERE: 60 Main St., Northport INFO: 631-651-2766, sandcitybeer.com FEATURES: Well-behaved dogs on leashes allowed; tasting room offers beer available by pint and by flights. WHERE: 12 Main St., Kings Park INFO: 631-546-5334, litoygame.com FEATURES: Leashed dogs are permitted; merchandise includes collectibles, toys, games, models and action figures. WHERE: 1960 Bayberry Ave., Merrick INFO: 516-544-4334, anchordownny.com FEATURES: Patio with a separate entrance for dogs, treats and water are provided; marina restaurant serving upscale seafood. WHERE: 36225 Main Rd., Cutchogue INFO: 631-734-5788, bedellcellars.com FEATURES: Leashed dogs are permitted outside; tasting room, hosts occasional events. WHERE: 63 North Ferry Rd., Shelter Island INFO: 631-749-1998, theislandersi.com PET FEATURES: Leashed dogs are permitted at the outside tables, waitresses will bring water for pets, biscuits are available for dogs; the American restaurant serves breakfast, lunch and dinner. Photo Credit: Greenport Harbor Brewing Co.
WHERE: 42155 Main Rd., Peconic INFO: 631-477-1100, greenportharborbrewing.com PET FEATURES: Well-behaved, leashed dogs are permitted, free "Life is Gruff" dog treats (made from the brewery's spent grain) are offered, occasional "Yappy Hour" dog social events and the annual North Fork Dock Diving Pet Expo are held at Greenport Harbor Brewing Co. Tasting room features several beers and events including trivia nights and live music. WHERE: 90 Second House Rd., Montauk INFO: 631- 668-2105, soleeast.com FEATURES: Pets permitted (hotel must be notified of pet at time of reservation), rooms feature Fat Boy-brand dog beds. LOCATIONS: Mattituck: 150 Bergen Ave., 631-298-0100; Cutchogue: 24385 Main Rd., 631-734-7070 INFO macariwines.com FEATURES: Dogs allowed; both locations have tasting rooms, artisanal cheese and charcuterie are served; occasional live music and other events. Photo Credit: Destination Unknown Beer Co.
WHERE: 1 S. Chicago Ave., Bay Shore INFO: 631-485-2232, destinationunknownbeercompany.com FEATURES: Dogs allowed; tasting room, features occasional live music, board game nights, a food truck parks nearby some nights. WHERE: 207 Main St., East Hampton INFO: 631-324-5006, themaidstone.com PET FEATURES: Well-behaved, well-groomed dogs and cats are welcome in some rooms and dining rooms, a special "Woof Menu" is available (and tailored to dogs of varying sizes and dietary preferences); $25 nightly for staying dogs (guests should add dogs' names to reservations). WHERE: 180 Woodcleft Ave., Freeport INFO: 516-377-2751, brewsa.com FEATURES: Dogs permitted in the courtyard; tasting room, several beers available by pint or by flight. WHERE: 161 River Ave., Patchogue INFO: 844-272-2739, bluepointbrewing.com FEATURES: Several beers, occasional live music and events. WHERE: 44535 Main Rd., Southold (pictured), 631-765-3500; and 231 Montauk Hwy., Water Mill, 631-726-7555 INFO: duckwalk.com FEATURES: Leashed dogs permitted; both locations offer tasting rooms and event calendars. WHERE: 1216 Main Rd., Jamesport INFO: 631-722-5256, jamesportwines.com FEATURES: Leashed dogs are permitted outside on the grounds; tasting room, food (including artisan cheeses, flatbreads, sandwiches, lobster rolls and gourmet chocolates) is available, event calendar features occasional live jazz. Here are all of the dog parks on Long IslandFrom amenities to park tips, we've rounded up everything you need to know before you take Fido out for an afternoon of outdoor fun. More than 50 furry friends available for adoption nowThinking about adopting a pet? These Long Island shelter dogs are looking for forever homes. Need a pick-me-up? Check out these pet photosNewsday readers share photos of their insanely cute pets.